I love spiders. They are fascinating in behavior. Their webs are works of art. Females are devoted mothers, risking their lives for their offspring (Green lynx spider, trapdoor spider). Yet I have to admit this large jumping spider startled both my husband and me. Jumping spiders in California are typically the size a pencil eraser. They prowl the rosebush like ocelots stalking prey in the forest. With the best eyesight among spiders, most books say they can see up to two feet away from themselves, in vivid color. And when they call them jumping spiders, they are referring to their ability to jump about six inches, leaping rapidly to grab any insect prey before it can escape. But this red jumping spider (Phidippus formosus) surprised us with its size and capabilities. 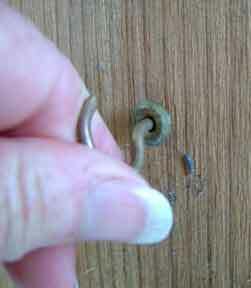 It was climbing up the outside of the house when it decided to walk across the second-floor bathroom window. When you compare it to the corner of the window, you can get an idea of its size. It would have easily covered a quarter with its body and legs. (It was close in size to the trapdoor spider that came in the house a few months ago.) 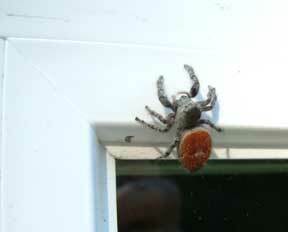 The brick red of the top of its abdomen identifies it as a red jumping spider. 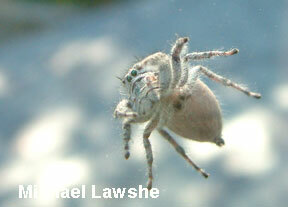 If a typical jumping spider is like an ocelot, this spider was more like a tiger. We got a great look at its underside and then it spotted us. It looked at us through the window and when I approached it outside, it spotted me coming when I was at least six feet away (3 times further than the books say they can see). 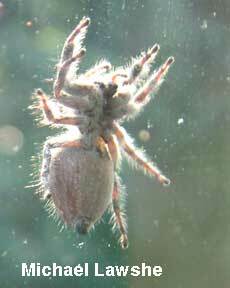 It struck a defensive posture like a boxer, holding its pedipalps up in front of its eyes. I didn't really want to see how far it could jump. Once it realized I wasn't a threat it continued its journey up the side of the house. I don't know where it was going. They supposedly build their burrows at ground level. This large female was headed toward the peak of our second story roof. Fast moving and on the prowl, she was climbing toward a golden polistes (Polistes fuscatus aurifer) wasp nest at the roof line. I don't think I would have wanted to be a wasp facing off with this voracious spider. But that is what natural balance is all about and the more we create a chemical-free habitat with native plants, the more biodiversity we are seeing in our backyard wildlife sanctuary. I've been wanting to do this for over a year, build a nesting box for native bees and other insects. My friend Doug Welch from A Gardener's Notebook had sent me various plans and ideas. 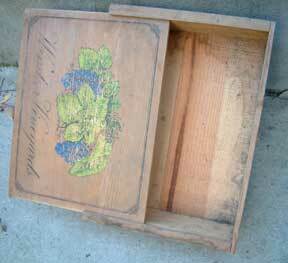 I had a wooden wine box with a sliding lid and it seemed perfect. 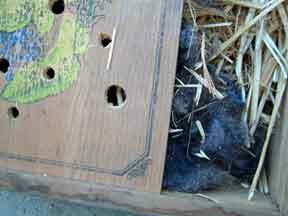 Finding the western bumble bee nest in one of my bird houses finally prompted me to just do it. I drilled holes of 3/8", 1/2" and 5/8" in the lid. Different bee species prefer different size holes. Then I filled the box with hay and dog hair. 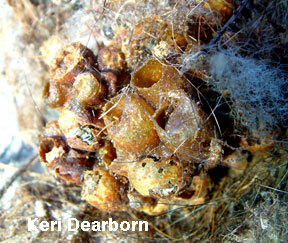 These were the kinds of fibers in the bird house that the bumble bees had liked. 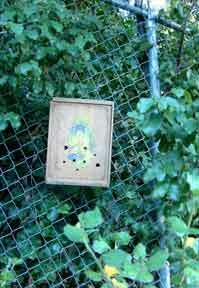 I mounted two hooks on the back of the box so I could hang it on the fence at the side of the garden. In this location we can see any activity at the nest box, it is near the vegetable garden, but it is out of the way enough that people won't be crossing any bee traffic. We probably won't see any action until spring, but we finally have our bee nest box up. Alarmingly, all of the bumble bees, adults and juveniles, still developing in their wax cells, were dead. What killed them? Was is the cold weather snap we had in October/November? There was a garden spider in among the corpses. Had this small spider preyed on the bumble bee nest? I can't imagine that it could have gotten to the juveniles in their waxy cells. 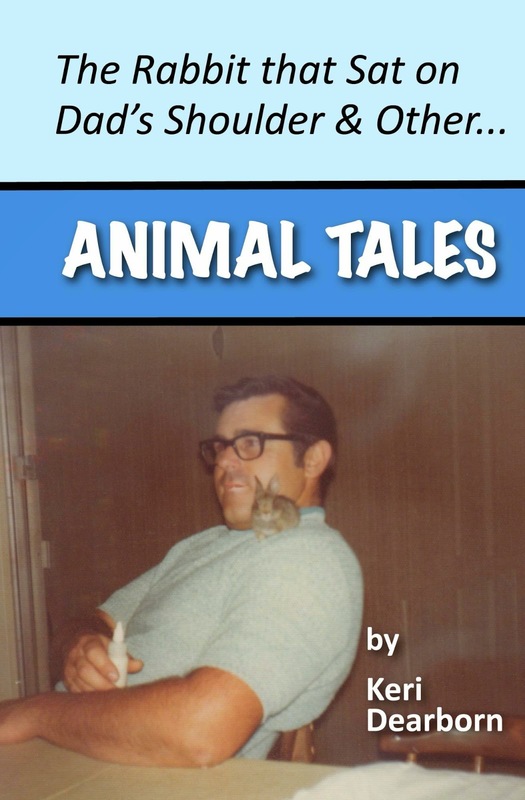 Was there some kind of mite or fungus that caused the death of all ages? I don't know. During the winter the queen bumble bee hibernates in a protected location all alone. She will emerge in the spring to start a new colony and then usually die. 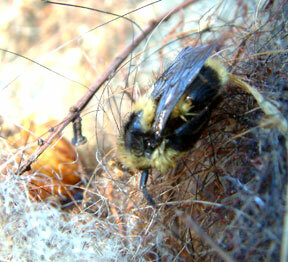 I hope that there was at least one survivor from this western bumble bee nest. (More on bumble bees: xerces.org) Our native bees are vital pollinators and typically are not susceptible to the same diseases and environmental conditions that threaten European honey bees. Most are not aggressive and are not a threat to people. We have noticed carpenter bees nesting in the yard before but this is the first time for bumble bees. I've wanted to create a native bee nesting site for some time. It seems now is the time to finally take on that project. Is she a little wild looking? Yes. And we love her all the more for it. Has she grown over the five years? Yes, and this is probably the last year we will be able to bring her in. But when you consider we have invited her in for five years, she was a great investment financially and environmentally. She is a carbon sink, storing carbon in her wood as she grows. How to bring in a live tree. 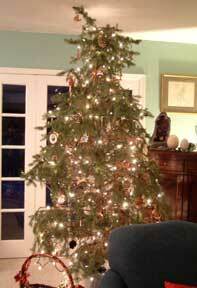 If you are thinking about a live Christmas or Holiday tree, take the plunge. The Earth will thank you. Ladybugs are insects that even a toddler can identify. Their red and black markings are distinct and their rounded shape appears nonthreatening. As predators of aphids and other garden leaf-eaters, ladybugs have one of the most positive insect profiles. Everyone loves ladybugs. But across the country native ladybug populations are declining. What is happening to these important and beloved insects? Citizen scientists can play an important role in helping scientists sleuth out this environmental problem. 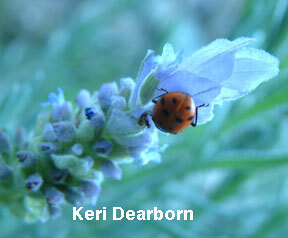 I spotted this ladybug on a lavender plant on December 9th. Ladybugs hibernate over the winter as adults and typically they group together in a protected location. One year we cut down a live Christmas tree and brought it into the house only to find that there were about 100 ladybugs hibernating in a clump at the center of the tree. The ladybug I took a photo of was out in the warm winter weather. (Climate Change in California) If it gets caught without a protected place to stay when the temperature turns cooler, as it is expected to do this weekend, will it survive the colder temperatures? Scientists need your eyes to help solve this mystery of Missing Ladybugs. I know most people think of Southern California as having year-round warm weather. And while it is true that we don't have snow in the lower elevations, we do actually experience cooler winter temperatures with a winter rainy season. Over the past few years I have been noting the signs of autumn: leafing out of the wild currants, ripening of the toyon berries. The winter hibernation of the western fence lizards and desert tortoises mark the seasonal change as well. While the tortoises are fast asleep, this morning I saw a young fence lizard out warming itself in the sun. 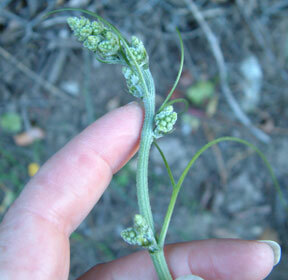 I've also been recording signs of spring: hummingbird nesting, blooming of the manroot and more. 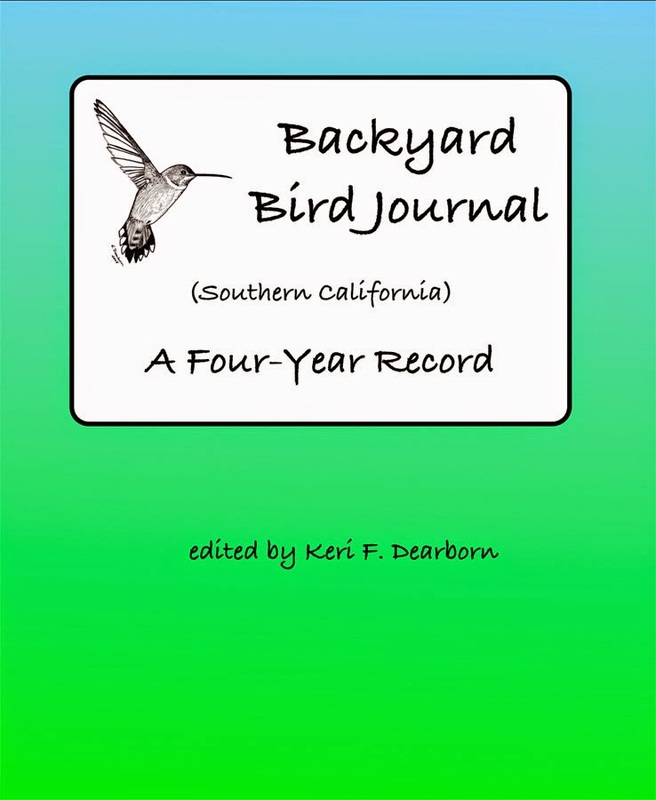 Last year the Allen's hummingbirds in our yard started to seriously nest in January. The earliest date we have recorded. A lone chick survived from these early nests because winter storms did arrive in early February. Winds tossed youngsters out of nests and sudden cold temperatures overwhelmed young chicks. The one Allen's hummingbird chick was the earliest recorded wild bird hatchling in North America in 2010. This year we had some early autumn rains, cold weather and then December has had some record warm days. 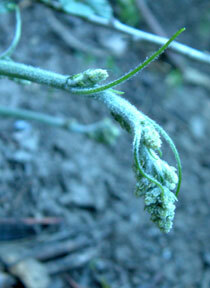 Last year we recorded the manroot blooming the first week in January. On Sunday, December 12th I took these photos of the manroot not only emerging from the ground, but getting ready to bloom. Will this plant survive to fruit in summer if it emerges so early from the ground? The male hummingbirds are performing breeding displays. Will we see nesting even earlier this year? If so, will the chicks survive when winter temperatures return? Are you looking for a unique and green way to decorate for the holidays? 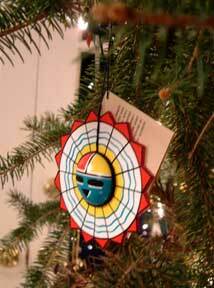 How about lighting your tree with eel power? Check out the following story and video on LiveScience.com "Christmas Eel Makes Tree Lights Electric."